A trusted and established company based in West Patel Nagar, New Delhi, India, and wholesalers for handmade fashion jewelry. On this site they present an online gallery of wholesale handcrafted fashion jewelry. India's largest collection of wholesale fashion jewelry, indian jewelry, trendy fashion jewelry, wholesale costume jewelry, and beaded jewelry. Bring you a line of jewelry that is exquisite, yet affordable. 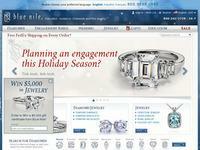 Offering over 19,500 jewelry designs, available in wholesale quantities at the cheapest prices possible. Golden Jade Jewelry Co., Inc.
Golden Jade Jewelry Company provides wholesale pricing on a fine selection of name-brand watches, loose diamond and jewelry in, among other choices, European, American and Oriental styles. Here you will find Fifth Avenue quality at downtown prices. Custom work orders and requests for consultations are welcomed by the staff at Golden Jade. Visit the store at 189 Canal Street in the Chinatown area of New York City. Upon entering Reinstein/Ross stores, vibrant precious stones set in rich colors of gold and platinum glimmer on the shelves. The handcrafted jewelry, reminiscent of ancient Etruscan and Egyptian designs with a modern spin, is a product of a long-term relationship between designer, Susan Reinstein, and gem trader, Brian Ross. For the worldwide jewelry industry, New York City is the most important place on Earth. There is only one jewelry show at the center of it all, JA New York. You can save on pre-owned Rolex watches at Bob's Watches. For Rolex watches in New York, here's the place to buy certified pre-owned watches. Want the best price on a Rolex watch? Check these prices. Shop online now, save up to 50% on certified pre-owned Rolexes. Jeweler, jewelry store, retail jeweler, diamonds, online jeweler, gold jewelry, diamond jewelry, diamond engagement rings, diamond rings, find jeweler. Natalia, with 15 years experience in the 47th Street diamond district, has an advantage over most jewelers. She provides exceptional items at prices far below retail.